Recently, we placed posters around The Tabernacle, a venue in downtown Atlanta. Our posters criticize that venue’s decision to host Jordan Peterson on Tuesday, June 12. Peterson is an academic turned self-help author and internet pundit. Peterson popularizes far-Right theories, cashing in on opposition to so-called “social justice warrior” culture. You can read and download our poster below. 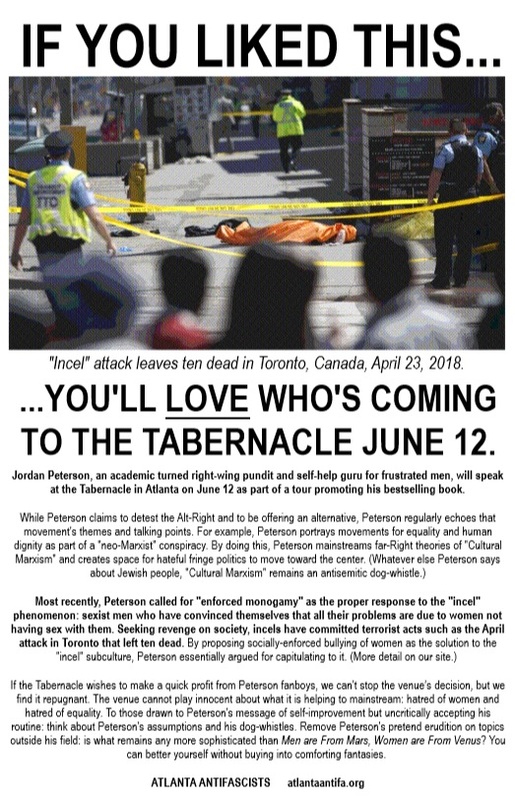 Poster about Jordan Peterson’s appearance at The Tabernacle on June 12. Click image for .pdf download. With this poster, we have mostly had our say about Peterson and his followers, except for one issue.